Here’s a simple step by step recipe to make a light, fluffy Victoria Sponge Cake –the ultimate Tea Party pleaser. This delicious British classic is great for hosting, or giving as a gift to even the fussiest of eaters. This recipe requires few ingredients and can be made very quickly – perfect for when you’re short of time! Everyone always wants seconds of this moreish cake so don’t expect it to last long. A super easy bake to make time and time again! 4) Using a fork, beat the eggs in a separate bowl. Gradually pour the eggs into the butter and sugar, along with the sifted flour, baking powder and milk. Beat until well combined and smooth, but don’t overdo it. 5) Divide the mixture between the prepared sandwich tins. Use as much of the mixture as you can but don’t fill the tins right to the very top. Smooth out with the back of a spoon or spatula. Bake for around 20 minutes, or until golden brown with the middle springing back when touched. You can also check the cake is ready by poking a metal skewer in the middle and a few other areas – if it comes out clean then the cake is done. 6) Once out the oven, go round the edge of each cake with a sharp knife to avoid it sticking to the tin. Careful not to cut into the sponge! 7) Leave to cool in the tin for ten minutes and then tip out onto a cooling rack/ plate. Top tip: if you have a tin where the base pops out it will make your baking life much easier! 8) To make the filling, beat the butter until soft. Gradually beat in the sifted icing sugar and drop of vanilla extract until you’re left with a smooth, creamy butter icing. Top tip: some use a whisk for this, but I find it easier to do by hand with a wooden spoon. 9) Once the cake is completely cool, use a knife to spread the butter icing on the bottom of one of the sponges and then spread the jam on top of the butter icing. Spread the filling fairly close to the edge so it can be seen, but not so close that it will ooze out when you add the top layer. Stack the other sponge on top of the jam. 10) Dust the top of the cake with icing sugar. Add chopped strawberries to decorate. 11) Enjoy with a cup of tea! If there’s any left, store in an air-tight container in a cool, dry place and eat within 2 days. On a wet week day in Devon, when my rain mac was leaving me feeling a little less than glamorous, I decided to ramp up the sophistication and go for a cream tea at Vintage Tea in Totnes. Those of you familiar with the town will know of its quirky cuteness – a well loved place that’s worth a visit for the high street alone. Vintage Tea still has that valued local business feel that is so important to the area, using only local providers, but also offers something a little different. It was a soothing escape from the dreary Thursday afternoon outside; almost transporting us to another era with fine bone china, luxury linen table cloths and classic jazz music in its light and airy tea room. Bliss. It’s not the cheapest of places for the area and is definitely more of an elegant treat, but what a treat it was. Too charming for words and their house blend (a mix of Earl Grey and Ceylon) is well worth a cup. If you’re in the Bromley area looking for a good cream tea, it’s well worth a trip to the Lavender House Cafe After my first visit last Saturday I’ve already decided this is going to be added to my little list of ‘regulars’ for both brunch and afternoon tea. We visited on Halloween and, as a place that goes out of its way to give that little bit extra with various events such as Pilates, Mummy Mondays and Pottery and Crafts, it’s not surprising the Lavender House Cafe was neatly decorated with bats and pumpkin fairy lights for a Halloween themed day. The staff had also made the effort to dress up and offered face painting for both adults and children from 9am-4pm. On entering through the main door you face quaint tables and chairs, a cushioned window seat, bunting, and a vintage cabinet filled with tempting treats. You make your orders at the counter, which freely displays all the cakes in glass cases. I don’t know about you, but I definitely like to eye up the cake selection before choosing and am a sucker for the aesthetics. 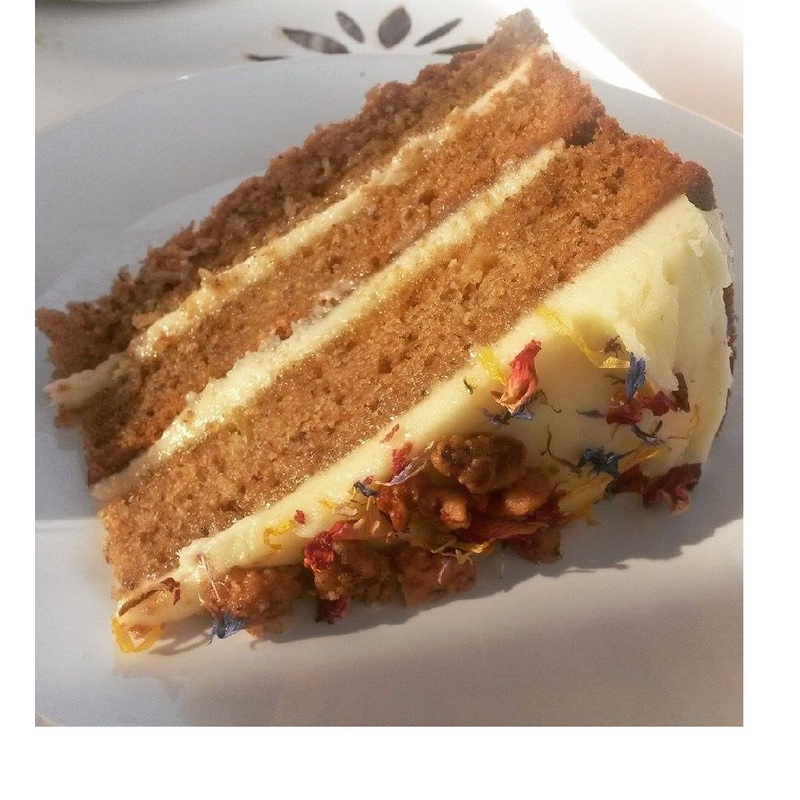 As such, I opted for the hummingbird cake which was a fantastic slice of delicious moistness. One of the big perks of the Lavender House is it also has a garden, so as it was a warm, sunny day we opted to make the most of it on the patio. Despite having a climbing frame and many little skeletons, witches and princesses running around excited for the holiday the place somehow managed to become a perfect haven for both adults and children. Both my friend and I are single and childless and as such usually notice when we’re relaxing right next to a playground, but everything blended perfectly well here. The house also has a kid’s lunch menu, including a brightly coloured card board lunch box that the (rather adorable) ‘little monsters’ 😉 could unpack at their leisure. 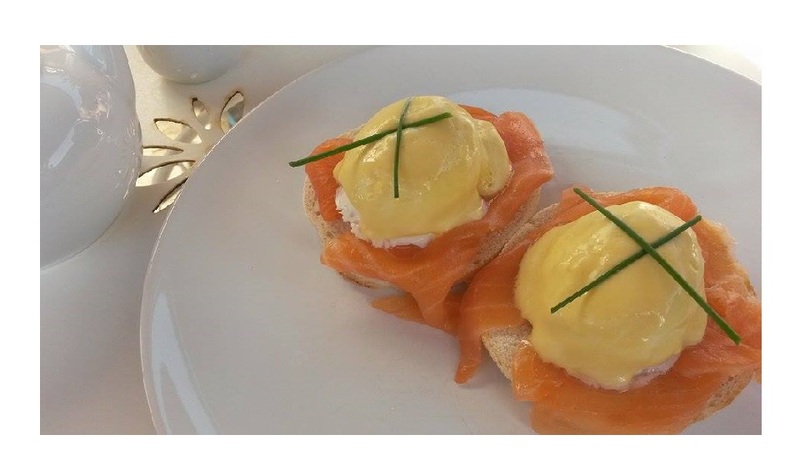 In addition to cake the Lavender House Café also offers a brunch and lunch menu, including a daily specials board to keep things varied with changing soups and other popular dishes. Despite being mainly bread based with classics such as eggs royale (my choice), benedict and your more hangover friendly sausage sandwiches, the menu had a lot of choice and also included the popular American style pancakes. Gluten free bread was readily available, as were ‘skinny’ versions of hot chocolate and coffee which still proved delicious and beckoned second servings. 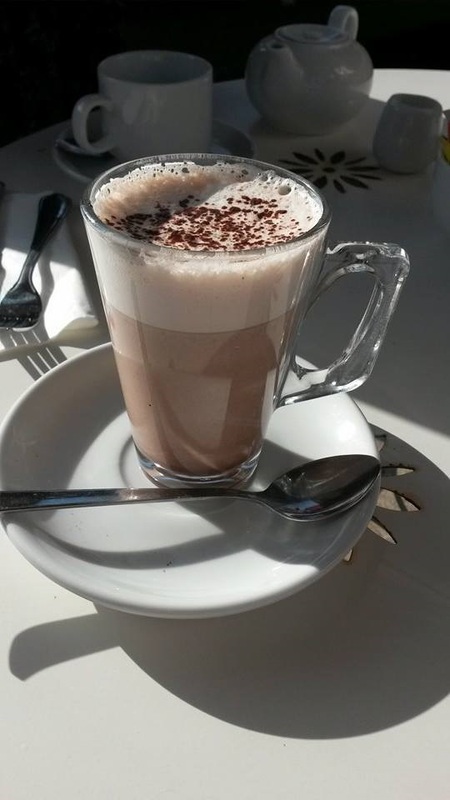 Skinny but scrummy Hot Chocolate! OR…you can go all out and throw in sandwiches, macaroons and a slice of cake on a three tier stand for £10.00. It’s no surprise the place is very popular so visiting, and booking a table to avoid disappointment, is highly recommended!